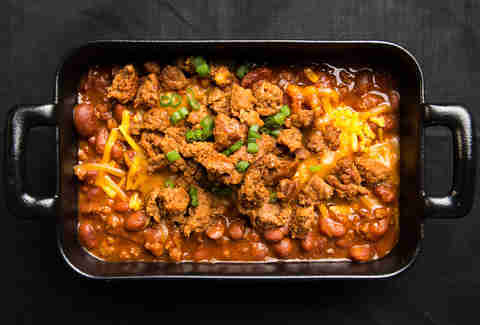 You could spend three hours torturing yourself with the aroma of homemade chili cooking on the stove. Or you could just heat up a can of the pantry staple in minutes and top it off one of these 10 ways. With so many options -- chorizo! 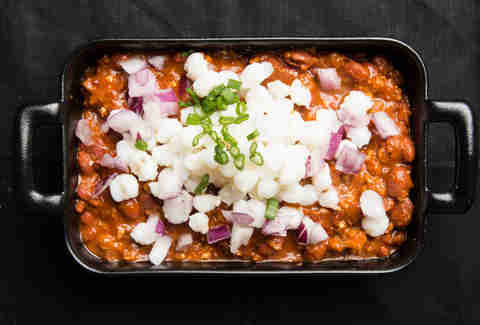 Pozole! Chocolate and chipotle! 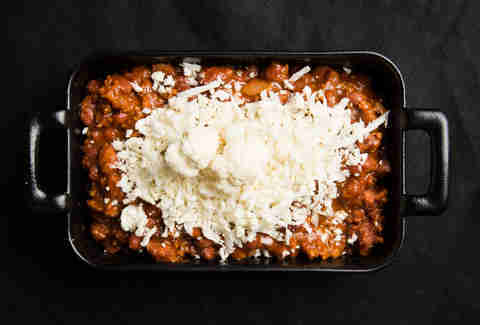 -- you can have beef-and-bean chili every night this week and not get bored. If you're a traditionalist, top it off with shredded cheddar, chopped red onions, cilantro, jalapeños, and sour cream. Finish it off with a recitation of the "Pledge of Allegiance." When beef alone isn't enough, pan-fry loose Mexican chorizo until crisp. Pair it with shredded sharp cheddar to temper the spice and add some creaminess, and chopped scallions for another layer of flavor. Whisk together 1 cup cornmeal, 1 tablespoon flour, 1 ½ teaspoons baking powder, ½ teaspoon cinnamon, and ½ teaspoon salt. Add ½ cup milk, 1 egg, 1 tablespoon vegetable oil, and ½ teaspoon honey and stir until combined. 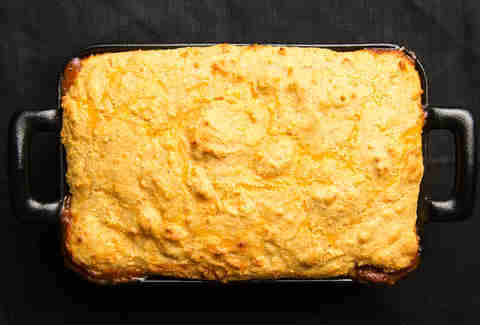 Pour chili into a small baking dish, sprinkle shredded cheddar on it, and spread cornbread evenly on top. Bake at 425℉ for 20-25 minutes. Don't knock it 'til you try it! 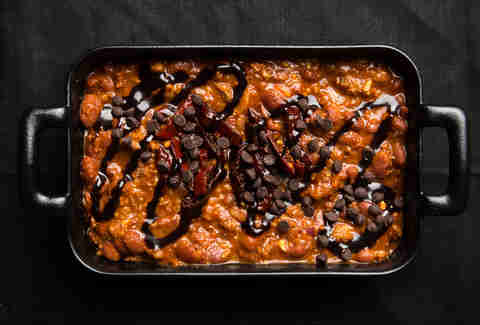 Chocolate and chiles add a ton of depth to chili. Mince two chipotle peppers in adobo sauce and stir in with the chili. Once warm, stir in an ounce of dark baking chocolate. Buh-bye meatballs, we're having our spaghetti with chili tonight! 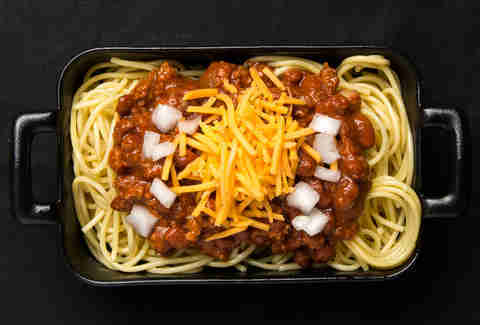 Finish off the noodles-and-chili combo with shredded cheddar cheese and chopped white onions. Pozole is a traditional Mexican stew. While you're picking up cans of chili at the store, grab a can of white hominy, too. Put the two together and add chopped onions and a squirt of fresh lime juice. For those who can't choose between steak fajitas and beef chili, stir-fry sliced red onions and bell peppers with salt and freshly ground black pepper until slightly softened. 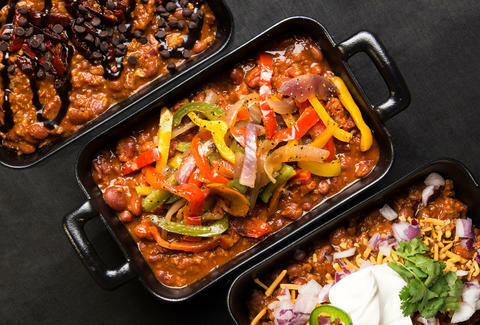 This will give your chili some color and crunch. Chili sometimes begs for a little sweetness. 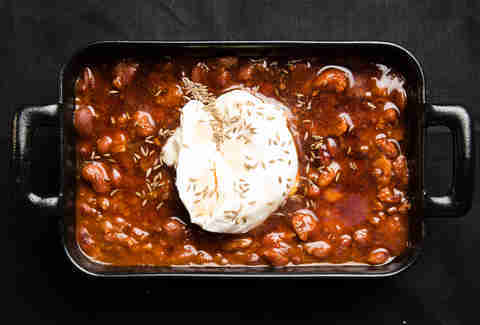 A dash of maple syrup will do it, but spiced sour cream keeps it from being cloying. 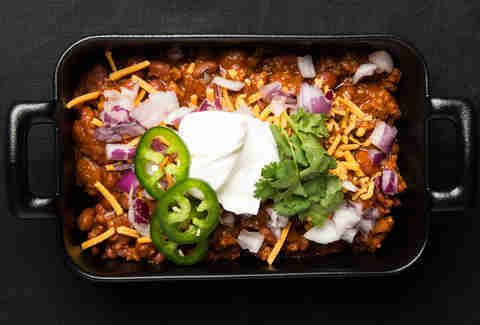 Stir maple syrup into the chili while it's heating up. Toast cumin seeds in a pan until fragrant and combine with sour cream. 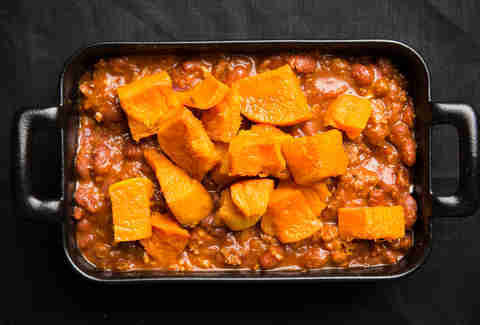 To evoke the feeling of homemade chili, drizzle cubes of squash with olive oil and roast in a 400-degree oven for 20 minutes. Stir it in. The texture will go a long way. Rather than cheese, try cauliflower! 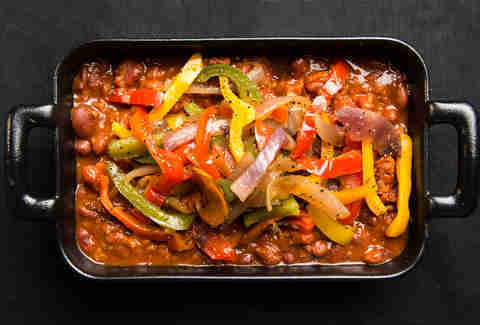 It's much better for you and helps bulk up chili. Blend 1 to 2 cups of cauliflower florets in a food processor and stir it into the chili as it's heating up.